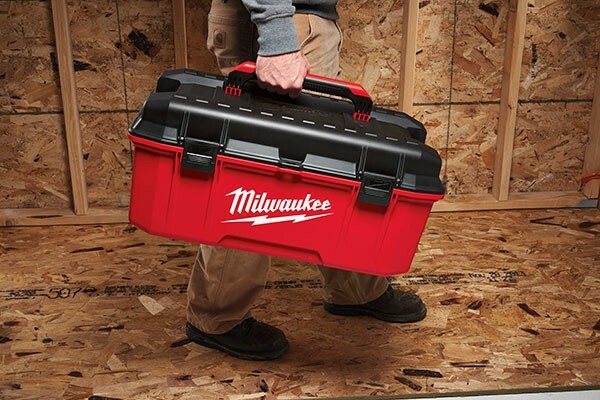 Many brands claim to make tool boxes that are tough enough to handle jobsite abuse, but how many of them can survive 1000 drops with a 50lb. load? 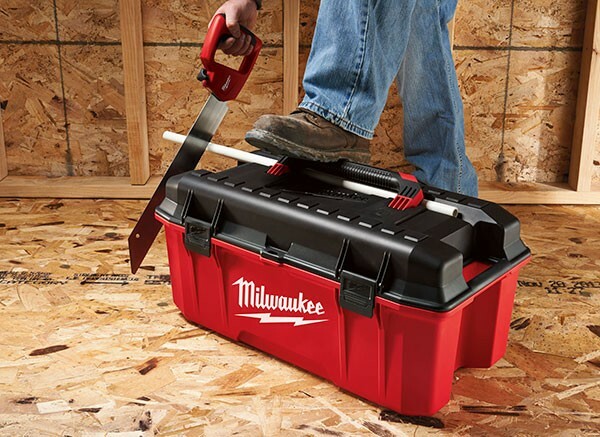 Probably not many, but Milwaukee says their new 26" Jobsite Work Box 48-22-8020 can. From bouncing around in the back of a truck, to being used as a workbench and a makeshift ladder, I have seen some tool boxes break in less than a year. 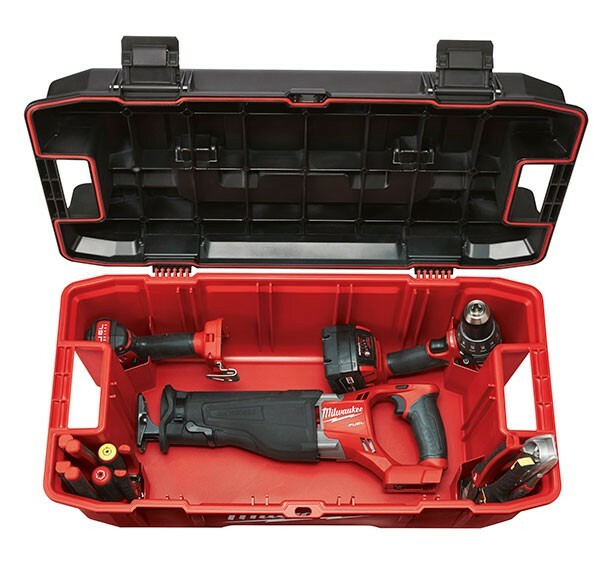 At $30-$50 a pop, I can see the value in a tool box that is truly jobsite tough. 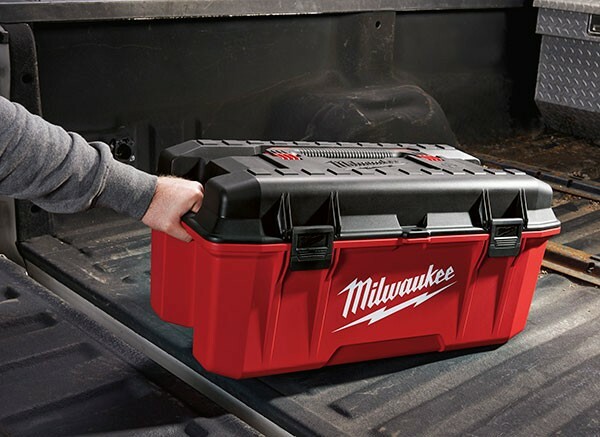 Milwaukee's new 26" Jobsite toolbox has been constructed using a proprietary high impact resistant polymer with reinforced corners, which gives it is durability. But its design also lends to its strength. With recessed latches and buttressed hinges, it has been designed to deflect debris rather than take the full impact. Organization was also a priority for Milwaukee, who seems to have found a solution for many common problems. Corner pockets have been added to hold tools upright for better organization. Mounting bosses (screw mounts) in the lid allow the user to hang tools. 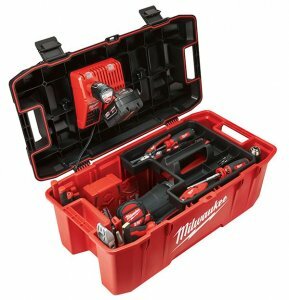 At 26" it is large enough to hold long or bulky tools, and a tray insert is included to organize smaller tools. A groove in the lid can be used to hold items for cutting, while the handle of the lid can be used to help clamp it down. The handle is also long enough that the user can adjust his grip to find the center of gravity. Or if you would rather, you can use the two side handles.